Keter Shem Tov, "All the holy teachings of R. Yisrael Baal Shem Tov" – selections of the Baal Shem Tov's teachings, arranged by R. Aharon HaKohen of Żelechów and Apta (Opatów). Two books in two volumes. Part I – Zhovkva, ; Part II – Zhovkva, 1795. First edition. 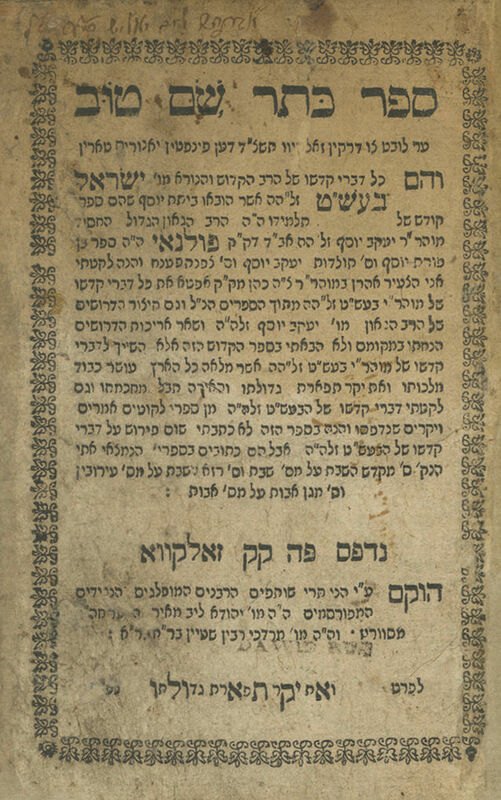 Printed by Yehuda Leib Meyerhoffer and Mordechai Rabinstein. Keter Shem Tov is a renowned compendium of the Baal Shem Tov's teachings. The book contains teachings of the Baal Shem Tov selected from the books of his disciples, R. Yaakov Yosef of Polonne and the Maggid of Mezeritch. This is one of the first compendiums printed of the teachings of the Baal Shem Tov. These two volumes were published in Zhovkva, 1794-1795. Approbations from Rebbe Menachem Mendel of Liska, R. Shlomo of Karlin and R. Avraham Moshe of Pshevorsk are featured at the beginning of Part I, followed by the "Tzavaah from the Baal Shem Tov". The subsequent leaf contains a letter which the Baal Shem Tov addressed to his brother-in-law R. Gershon of Kitov, in Eretz Israel. An approbation by R. Moshe Tzvi Hirsh Meisels is printed at the beginning of Part II. The compiler of this book, R. Aharon HaKohen of Żelechów and Apta (Encyclopedia L'Chassidut, I, p. 157), authored several popular Chassidic books, including Or HaGanuz LaTzadikim, the Tefilla Yeshara – Keter Nehora siddur and other books. He was the disciple of R. Uziel Meisels of Ryczywół. He succeeded R. Levi Yitzchak of Berditchev as rabbi of Żelechów, and later served as rabbi of Biłgoraj. In 1803, he was appointed rabbi of Apta, alongside Rebbe Avraham Yehoshua Heshel, the Ohev Yisrael. This edition has several variants. The first part was published in several variants with minor typographic variations and differences to the text of the title page (see Bibliography of the Hebrew Book, listing 139450). Two different title pages were printed for Part II, one a copy of the text of that of Part I, with the addition of the words "Part II", and the second with a different text. Some copies feature both title pages, but most copies only have one title page. This copy features the first type of title page. Signature on title page of Part I: "Avraham Leib Yalish Segal(?)…". Two volumes. Vol. I: , 28 leaves. 17.5 cm. Fair condition. Stains and wear. Dark stains to upper part of most leaves. Worming to title page, slightly affecting text, repaired with paper. Marginal paper repairs to title page. Tears and damage to edges and margins of many leaves, slightly affecting text on several leaves, repaired with paper. New leather binding. Vol. II:  leaves. 17.5 cm. Most leaves in good-fair condition. Stains and wear. Minor damage in several places. Worming and tears to some leaves, slightly affecting text in several places. Large marginal tears to last three leaves, affecting text, with handwritten replacements and paper repairs. Upper margins of several leaves trimmed, affecting column headings (three leaves with headings almost entirely lacking). New leather binding.